Retro racer dated for Switch. The Switch version of Horizon Chase Turbo will launch via the Nintendo eShop on November 28, developer Aquiris Game Studio announced. The retro racing game first launched for PlayStation 4 and PC in May. An Xbox One version is also planned for release in 2018. Horizon Chase Turbo is standalone homage to classic 16-bit racing games that defined a generation of high-speed, frenetic arcade fun. 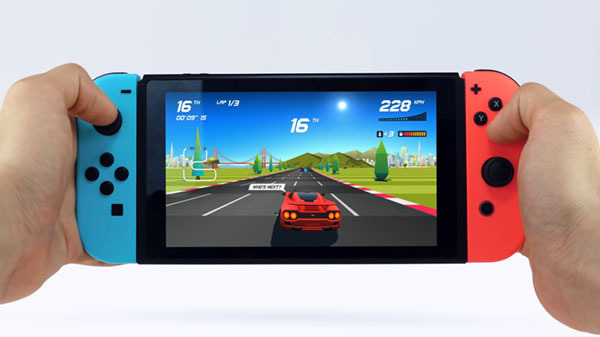 The simple and tight controls paired with precision gameplay and detailed depth combine for a nostalgic experience for racing, arcade, retro, and multiplayer fans young and old. Horizon Chase Turbo’s head-to-head split screen multiplayer and catchy contemporary chiptune-style music add to the game’s painterly aesthetic and competitive action. Amazing old-style split-screen multiplayer up to four players. Four game modes: World Tour, Playground, Tournament, and Endurance. Watch the Switch release date trailer below.